All of these MYOB solutions are designed for the Australian and New Zealand markets and localised to comply with the unique requirements of each country. The number one choice of mid-market ERP software in Australia continues to be MYOB. The relatively new cloud-based ERP solution is MYOB Advanced. Its journey in Australia began in 2015. The fully featured business management system covers your entire business operations, from accounting to administration to warehouse and everything in between. Being cloud-based, it gives businesses access to your information, anywhere, anytime. Find out more about its flexibility here. MYOB Advanced is a flexible and scalable management solution, designed to grow with any Australian or New Zealand business. But what is behind this powerful, accessible software? In August 2013, MYOB sealed a multi-million-dollar deal with Acumatica – the world’s fastest growing provider of cloud-based enterprise resource planning (ERP) solutions. As part of the deal, MYOB received exclusive rights to market Acumatica under a new name within the Australian and New Zealand markets. The cloud-based ERP system is now known as MYOB Advanced. So who is Acumatica? Acumatica is a leading innovator in cloud ERP, with customers located around the world. As the fastest growing provider of cloud ERP software, they support mid-sized business delivering adaptable mobile technology enabling a complete, real-time view of businesses anywhere and anytime. Acumatica continues to be recognised for its many achievements. The company has surpassed the 5,000th customer mark and has achieved 88% revenue growth in the past year. “Last year was another successful growth year for Acumatica as we continued to help our customers streamline their operations, build their businesses, and realize digital transformation,” said Jon Roskill, CEO, Acumatica. For more information on the 2018 Acumatica Review – Visit this page. If your business would benefit from 24/7 accessibility, real-time information and a clear view across all divisions of your company, then have a chat to one of our friendly team members to discuss your options and how MYOB Advanced can help revolutionise and grow with your business. What can our Melbourne Team help you with? Kilimanjaro continues to grow and expand our team, in order to maintain the highest standard of service for our clients. We are proud to have a full team of MYOB Experts in Melbourne to be your local trusted guides. As discussed in “Meet the Melbourne Team” article, we can ensure accessibility and flexibility for our Victoria based clients with our knowledgeable team. Why is it important to have a local guide? At Kilimanjaro Consulting, we understand that maintaining an ERP system within a company is a long journey. Being in trusted hands makes all the difference. Whether it is understanding the ins and out of your system, having support on technical issues or access to a range of training options for your team to be able to maximise the software, Kilimanjaro is here to help. How can we help you with your MYOB products in Melbourne? If you are reading this, chances are your business is based in Melbourne or in a location nearby. You have either conducted some research about MYOB ERP solutions or you feel your business is ready to take the steps to improve efficiency. You might fear that you will choose the wrong implementation. Or a service partner which could cause chaos and a huge financial loss. Don’t worry, it doesn’t have to be this way. You can be in full control of your business by choosing the right people to work with. The Kilimanjaro Tribe are driven to scale the technology mountain. Our difference is that we have a long history of successful implementations, proven methodologies and happy clients who are proud to share their stories with others. Combining our skills in business consulting, accounting and IT, the Melbourne team are in a strong position to service companies like yours. Is your business growing and you feel your systems are no longer able to cope? Have a chat with one of our knowledgeable and friendly team members in Melbourne or other convenient location. Tell us about your current business requirements and pain points so that we can guide you in a direction that suits your companies’ unique needs. We will let you know if your business is at the stage where you need to invest in new tools to help manage your company growth. Our MYOB Experts in Melbourne can help you with any questions you may have regarding your software and will provide constant support. They will keep you up to date with the latest software upgrades as well as sharing insightful information to ensure you are getting the most out of your MYOB software. As our philosophy states, we always want our clients to be as self-sufficient as possible. Guiding you and your business from the early beginnings of an ERP implementation right to the end is our goal. We have invested heavily in developing training courses that give businesses the skills to use their MYOB Exo or MYOB Advanced software confidently. Does your business have offices in different locations? Kilimanjaro has got you covered not only in Melbourne but across all of Australia. In today’s advancing world, we have a range of training options that suit every preference. Whether you prefer a classroom environment, or online or on-demand, we can cater to your preferences Want to know more? Check out our range of training opportunities in today’s advancing world or go straight to our 2019 training schedule. For all the MYOB Exo users or potential users, we encourage you to book a spot at our bi-annual MYOB Exo User Groups. Running across Australia and Auckland, NZ, the event brings together MYOB Exo users to discuss personal experiences with MYOB Exo through customer-focused panel sessions. Our team will be discussing upgrades and connected services. The groups also feature special guest speakers who provide insights into maximising your business potential. The MYOB Exo User Group Forum is hosted in Melbourne twice a year. It is a FREE event open to ALL MYOB Exo users. Just remember the spots are limited. First in first served! To reserve your spot for the 2019 Q1 events, visit our page here. Whether you are a current client, an MYOB Advanced or MYOB Exo user or a company that is seeking business improvement efficiencies through the intelligent use of technology, feel free to contact our Melbourne team or just drop by our Melbourne Office. Kilimanjaro’s team of MYOB experts are here to be your local guide. You may not have done it before, but we have. Join the Kilimanjaro Team as we explore the benefits of a “Connected Business” in today’s digital world. Kilimanjaro and Enprise host the MYOB Exo User Group Forums for you to gain knowledge while exchanging experiences in using one of the most popular ERP software systems in Australia, MYOB Exo. The User Groups gives us the chance to give back to our valued clients by sharing knowledge of the software, updates and newest releases with you. The User Group is also a great opportunity to meet our connected services team as well as guest speakers discussing the importance of knowing your clients before embarking on a digital marketing strategy. Editors Note: This article was originally published in May 2016 and has been reviewed and updated in order to provide the most relevant and accurate information. You will notice the renewed version includes a 9th key difference between MYOB Exo and MYOB Advanced. Kilimanjaro Consulting has been a long-time implementer of MYOB Exo and MYOB Exo Payroll software. What you may not know is that we also implement MYOB’s latest cloud-based offering, MYOB Advanced. Not sure what the difference is? We cover eight key differences which may help you understand which product would be best suited to your business requirements. MYOB Exo was designed as an “on-premise” software system. This means that you need your own server hardware as well as the underlying database – Microsoft SQL. Recent advances in hosting and data centres mean that MYOB Exo can now be hosted, removing the requirement of having your own server hardware. Conversely, MYOB Advanced is a true software as a service (SaaS) system. This means that you do not need any server hardware or software. All you require is a fast internet connection to access the system via a web browser such as Internet Explorer, Chrome, Firefox or Safari. For access to MYOB Exo, businesses are required to purchase user licenses upfront and pay an annual license fee (ALF). With MYOB Advanced, a monthly subscription is paid based on different license levels, each level providing specific functionality. Your implementation partner will guide you as to which licenses would be required for your business needs. As businesses grow they become more complex and more unique as they move to differentiate themselves from their competitors.. One-size-fits-all software (like MYOB Essentials or Xero) is only suitable for smaller companies with simple needs. If your business is growing and your needs are becoming more complex, it is worth considering software solutions that can be configured to meet your unique requirements. MYOB Exo is a highly configurable system. It can cater for complexity and differentiation. It requires consulting services to implement, as the system itself is too complex for the average user to configure themselves. Once configured, however, it is very user-friendly. The benefit of configuration is that your business processes become embedded in your software. This will force the user to follow these defined processes.. In the typical Exo business, there is often a high level of trust among team members, and one team member may perform multiple roles. The separation of responsibilities or duties is not clear-cut. Auditability is important, but not at the expense of efficiency. MYOB Advanced has more refined segregation of duties. This leads to a situation where more than one person may be required to complete a single task. For example, employee A may raise a Purchase Order up to a certain dollar value, but above that, Employee B needs to approve it. Employee C may be responsible for creating new Creditor records. MYOB Advanced is more robust in managing segregation of duties if this is something your organisation requires. This leads to improved auditability and compliance with GAAP and IFRS principles. When selecting software, a decision must be made based on trust versus separation of duties. In a trust-based organisation, separation of duties will be seen as an unnecessary constraint and will add a layer of bureaucracy to simple processes. In larger, more complex organisations, separation of duties becomes a requirement. MYOB Advanced is more suited to companies that require separation of duties. Historically, MYOB Exo has found its place in businesses dealing with inventory. Importing, warehousing, distribution and some retailing businesses have experienced massive improvements in efficiency using MYOB Exo. It also has very strong Job Costing which can be used for project costs. Manufacturing is somewhat limited, with a bill of materials (BOMs) being the most common way of managing simple manufacturing or kitting. A number of add-on products or connected services further extend the footprint of MYOB Exo. MYOB Advanced is an extremely good fit for organisations that are dependent on their General Ledger to track costs and revenue. This means professional services organisations, government, semi-government or quasi-government agencies, not-for-profits and corporates are all good candidates for MYOB Advanced. While MYOB Advanced has good functionality for inventory-based businesses, care should be taken when deploying this in organisations where a separation of duties is not required (see point 3 above). MYOB Advanced is extremely suited to companies trading in multiple entities, multiple countries and in multiple currencies. MYOB Exo uses Microsoft SQL as the underlying database. What makes MYOB Exo unique in the midmarket is that your implementing partner has direct access to the SQL database. This means that configuration can include extra fields, stored procedures and triggers. If this is done in a disciplined and structured way, there is no detrimental impact when upgrading to the latest version of the software. The flexibility afforded by direct access to the SQL database also makes integration with other systems possible. MYOB Advanced uses MySQL as the underlying database. This is hosted by Amazon Web Services (AWS) so no direct access to the database is possible. The architecture of the software interposes a configuration layer between the database and the software. As direct access to the database is not provided, integration must be done using the Application Programming Interface (API) provided. Upgrades are done in the SaaS environment and configuration changes are preserved in the interposed layer. MYOB Exo was developed in New Zealand by Exonet in the 1990s. It was way ahead of its time and was the first ERP system to use Microsoft SQL and Delphi. The product benefited from investment by Solution 6 and later investment by MYOB. The product would currently be classified as a mature product. The benefit of a mature product is that with large numbers of users, most “bugs” have been dealt with. A mature product is stable and has broad and deep functionality. The advent of the web and connected services has given mature software a new lease of life and the decline/end of life phase is unlikely to be reached within the next 10 years. MYOB Advanced is distributed under license to Acumatica and MYOB is represented on the Acumatica board. Acumatica is the fastest growing ERP software in the world and is the first ERP system designed for the cloud. 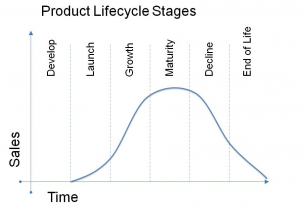 It is relatively new and is currently in the launch/growth phase. Typically, software in this phase will have gaps in functionality. MYOB Advanced has been localised for Australian/New Zealand business conditions. As the number of users grows, one can expect that the functionality gaps will be rapidly closed. One of the big benefits of SaaS is that bugs can be dealt with quickly, and often without users even knowing that they have been identified and fixed. MYOB Advanced allows other cloud software solutions to be embedded. End users will not be aware that they have switched from using one piece of software to another. For example: While MYOB Advanced may be the core financial system, something like JAMS may be the manufacturing solution. This is embedded within MYOB Advanced and to the end user, it looks and feels exactly the same. Where a suitable internet connection is not available or where immediate response time is required, SaaS systems are not an option. Internet connectivity in Australia is not always consistent. This is a primary consideration before choosing an ERP system. MYOB Exo can be run locally. Although some services within MYOB Exo do require an internet connection (for example, geolocations), these services are peripheral to the core and the system will function well without an internet connection. Where MYOB Exo is hosted in a data centre, the internet connectivity requirements will be same as for MYOB Advanced. Because MYOB Advanced is SaaS, it is hosted centrally via Amazon Web Services in Australia. By its nature, SaaS requires a fast internet connection. As data is being uploaded and downloaded, a synchronous internet connection is preferred. While the MYOB Exo General Ledger allows extensive configuration, there is a single control account for each of the sub-ledgers (debtors, creditors and stock). This means that while a Profit and Loss statement (P&L) can be produced for each branch or division, it is difficult to produce a Balance Sheet for each branch or division. If a Balance Sheet is required, branches or divisions can be dealt with as companies, but this then requires intercompany consolidation. MYOB Advanced has a very flexible General Ledger structure.. Transactional dimensions can easily be added and reporting lines configured. Budgets in MYOB Advanced can flow down to the different GL dimensions described above. Multiple divisions can be catered for with both P&Ls and Balance Sheets. Multiple companies are also well handled with a smooth consolidation process. MYOB Advanced can manage multiple countries, multiple currencies and multi-company requirements. Businesses can set up and automate deferred revenue and expense schedules. 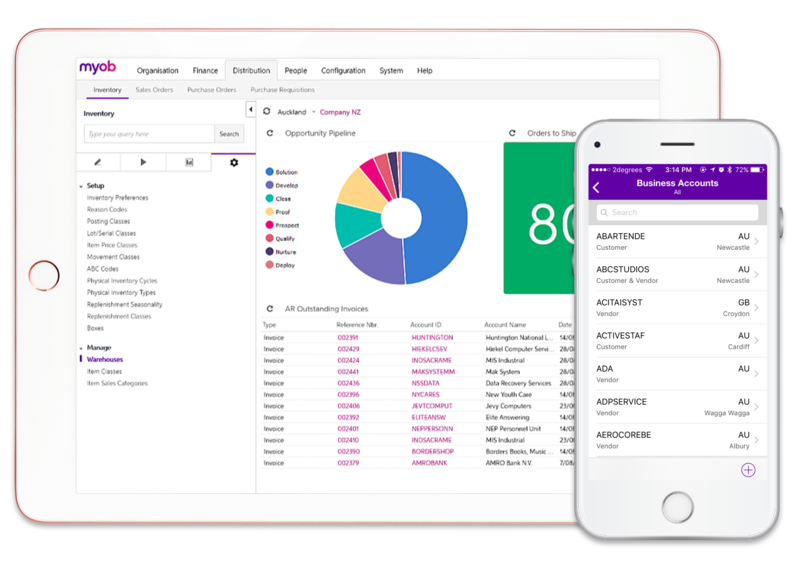 MYOB Advanced provides native drill down functionality, meaning you have the ability to drill down from financial reports to source transactions. MYOB Exo does provide consolidation functionality, but these need to be run in a separate database, whereas MYOB Advanced features live consolidations and intercompany transaction processing. MYOB Advanced allows you to group companies within one company site, which means there is no need to log in and out of multiple companies. MYOB Exo requires custom development to fit business requirements around system automation or workflows. One of the popular features within the MYOB Advanced platform is the ability to natively automate across many areas of the system. MYOB Exo is more limited in auditing capabilities but can be enhanced with further development, whereas MYOB Advanced has auditing capabilities natively built-in across many areas of the system. In terms of mobility, MYOB Exo is limited with Exo OnTheGo however connected services can assist in this area. MYOB Advanced has mobile applications that have been developed and enhanced. The application is responsive and accessible on most devices. If you are a larger, more complex business that would benefit from automation, mobility, remote access and multi-company management all in one, MYOB Advanced could be the solution to your pain points. A major reason why ERP implementations fail is due to the unrealistic expectation of the client, fueled by a cycle of misinformation. Kilimanjaro’s goal is to ensure a low-risk and smooth implementation for our clients, and improvements in efficiency after go-live. ERP systems and implementation can be quick and inexpensive. This is a dangerous trap to fall into for businesses yearning for efficiencies but with a tight budget. A company promoting ‘simple and fast’ ERP solutions are providing a “one-size-fits-all” system, which is exactly what you are trying to move on from. It will not match your specific business requirements and will hinder your long-term business growth. Implementation is an investment and should be supported from beginning to end. If the implementer does not look at each business and their processes individually, they cannot provide a low-risk approach and the relationship with the client is destined to be a troubled one. ERP software can be costly. Incidental costs such as Travel. Firstly, the size and stage of the evolution of your business will be indicative of which ERP system is best suited and the size of the investment you will need to consider. The basic law of business balance says you cannot pay a little and get a lot. It can’t be done. Visit our page for guidance on selecting the best ERP system for your business. Implementing an ERP system into your business will ensure success, efficiencies and reduced labour. Although this should be the case, an ERP system is a tool Simply purchasing and implementing an ERP system may relieve your current pain points, but this is a long-term investment and must be able to scale as you grow. Your business processes are constantly changing and you must be able to review and reconfigure as you move along your businesses journey. For more information on whether an ERP system will solve your problems and improve efficiency, read here. ERP failures rarely have anything to do with the actual software. There are plenty of horror stories of software failure destroying businesses, but in fact, it is rarely the fault of the software. For a system to have a successful implementation, you will need a team effort from both the implementor and the client. While configuration errors can lead to failure, so can a lack of diligence on the part of the client. More often than not, a system will fail due to organisational issues, such as not enough focus on reviewing business processes or a lack of project management. This means that the ERP system not aligned with your current business process or strategies. A good implementer has had plenty of experience with clients just like you and can guide you up the technology mountain, with a pathway to growth and success. The best time to implement your ERP system is at the start of a new financial year. In theory, implementing a system at the beginning of a financial year makes sense. You have a clean cut over point to a new system. for accounting purposes, the start of a new financial year is also the busiest for most businesses, especially the finance team. Implementing a new system into your company means extra time and patience with employees to learn how to properly learn to use the new system. The implementation process is a stressful time and the greatest risk to an implementation is a lack of proper resourcing. Read our “best time to implement” to find out more. Choosing the right ERP implementation partner can be more important than the choice of the software. MYOB software design and the build is specifically for the Australian market. Others are from overseas and are localised to meet Australian business and legislative requirements. As legislative requirements change, these software houses will need to be prepared to update their software. Single Touch Payroll (STP) is a perfect example of a new local (ATO) requirement that requires a huge investment by the software house. Make sure you are very clear on your own requirements. All the bells and whistles will not help you to solve your problem if that specific piece of functionality is not supported. A good example is your stock costing method. If you use FIFO, and the system you are considering is based on Average Costing, you need to be aware of this before committing to purchase. The design for ERP systems is for small, medium or large and complex businesses. The ERP’s design takes into account factors such as Separation of Duties (or Separation of Responsibilities). If in your business, one employee is multi-tasking and responsible for multiple functions, a system which splits these functions up into sperate processes or workflows will be very cumbersome. In a large organisation, this may be exactly what you want. Nowadays, for remote and simple access, most ERP systems are hosted in the cloud. If you have a specific requirement for an entirely on-premise system (Security concerns, or a poor internet connection, for example), check on this right at the start of the selection process. Once you have considered everything software and hardware related, you have to make the decision of which implementer to go with. Even though you may have chosen the ‘most suitable” product available on the market, it will not benefit you unless you have an implementer that knows what to do with the software. You need to feel in safe hands. Someone that will assist you with the selection of the most suitable product for your business and will then use a structured methodology throughout the implementation process is important. If you are not sure what to expect from your implementation Partner read our article on “What to expect from your Enterprise Partner”. If you would like to know more about ERP Software and the methodology we use for implementation and the services we offer, don’t hesitate to call us on 1300857464 or simply fill in the form below and we will contact you shortly. When inventory-based businesses don’t have full visibility of their inventory, they start facing problems such as running out of stock at the worst possible time, having it in the wrong warehouse or keeping too much stock when it is not needed. All of these factors have a significant impact on cash flow, affect overall expenses and complicate logistics. It doesn’t matter if your warehouses are disbursed across the city, in different states or even different countries: you should be able to have full visibility of how much is where. Real-time information about stock availability leads to increased customer satisfaction. If you don’t have the right system in place to allow you to make business decisions, now is the time to consider implementing a customizable ERP system. MYOB Exo is a fully integrated financial and business management system. The software provides a complete financial business system that enables dynamic businesses to keep growing. MYOB Exo gives businesses the option to set up multiple stock locations. Multi-stock location is a feature that provides full visibility of your stock in different areas or your warehouse, different warehouses, or warehouses in different states or locations. This means that businesses are able to supply or transfer stock for a customer by having control and visibility over stock locations and availability, using MYOB Exo. While using MYOB Exo you will have access to reports providing accurate stock information and a single view of all stock, no matter where it is. If you are managing thousands or millions of S.K.U.’s you may require to hold reserve stock for key clients. For example, a company may order a large quantity of an item (or items) on one purchase order, but request staggered delivery or delivery to multiple locations. For example, Woolworths places an order of 500, 000 items, but does not want it delivered all at once. Your business will need to “virtually” hold the stock, possibly even in multiple locations. By keeping an accurate record of committed stock. This will ensure your “available for sale”: stock numbers are always accurate. If you are managing the stock of raw materials and finished products, you will also have the visibility to see this stock separately. MYOB Exo gives you 100% visibility of stock, including ordered, incoming, receipted, committed, transfer out, transfer in etc. The system automates the management of stock held in multiple locations. You can wave goodbye to the laborious work of creating manual reports in Excel and therefore the risk of an inaccurate stock, leading to dissatisfied customers. MYOB Exo multi-stock locations, allows you to categorise products or services into groups for the purpose of your product catalogue, price lists or for sales analysis. Multiple reports are available for reporting stock movements into, within, and out of your company, including transfers between locations. Stock can also be seen per status; physical stock, not for sale, committed, back order, incoming. Minimum and maximum stock levels can be set per location and separate bin codes can be set per location. [Multiple Stock locations per item can be dealt with using the Blue Echidna add-on.] If multi-stock locations is a factor in your business, you are most likely dealing with multicurrency as well. MYOB Exo will support you with this too, with no hidden or missed on-costs. For more information, visit our page on Multi-currency functionality. What if you are running MYOB AccountRight? If you are a current user of MYOB AccountRight, you may know that this software is being phased out, and MYOB recommends users to migrate to a newer version of the software. Unfortunately, the newer version lacks some of the functionality you may require. When considering transitioning to the new software, you need to make sure that the specific functionality you require is available. After the software transition, you should still be able to run your business as usual. Take control of stock control with MYOB Exo. Running the risk of being over or understocked. MYOB Exo is a complete, fully integrated financial and business management system. It is highly configurable to meet your business’ needs today and in the future. Contact us today for a non-obligatory consultation to discuss your current requirements and how MYOB Exo can improve efficiencies in your business. For most businesses, having access to the right information, on time, and across the entire company is crucial for good management. Management Teams and Executives are constantly in need of adequate information, here and now. Not having access to real-time information of what is happening in your company becomes frustrating. At Kilimanjaro, we understand this as you aren’t able to make important decisions based on facts. Thankfully, MYOB software gives businesses this accessibility. MYOB Advanced is a cloud-based ERP system that covers all aspects of your company, whenever and wherever you are. Using MYOB Advanced removes the hassle of storing information directly on a computer on-site and gives your entire business access to what is most important right at your fingertips. This means that your business gains flexibility with a scalable management solution, which is designed to grow with your business. Imagine having access to the information you need in your company, anywhere, from any device: tablet, smartphone or laptop. Whether you are at the airport, travelling across the country or simply working from home, you have the ability to make important decisions and act accordingly 24/7. Are you looking at your IT management and asking why is this costing so much effort? On-premise software might not be ideal for you, with the associated hardware, administration and maintenance requirements. MYOB Advanced is a solution that doesn’t require any of the above resources. The software is subscription based meaning you pay what you use for. Deployed via SaaS, and hosted on Amazon Web Services (AWS) means it can be accessed from any web browser on any Internet-connected device. You never have to worry about whether your information in secure. Backups are automatic at no extra charge. All transactional data is backed up daily on a 30-day backup schedule. MYOB takes the privacy and security of their clients’ business data very seriously and with the support from the Kilimanjaro Team, you are in safe hands. There is nothing more frustrating than being restricted to your system due to constant upgrades and outdated versions. When using MYOB Advanced, maintenance and upgrades happen according to a schedule, in the cloud. There is no downtime to upgrade your system with the latest features. Everything is run over-night, so your ERP system is kept up-to-date and you have access to your company information whenever you need. Tired of manually entering data to extract reports? Easily set up automation that will process data on your preferred schedule and you can log in to see the results. Dashboards can show you the state of your business at a glance, or provide more in-depth reporting. This means you can monitor your cash flow, your daily sales or identify your most profitable products. MYOB Advanced is the right ERP for any growing business that wants to increase work efficiencies while reaping the benefits of being in the cloud. Working in the cloud means possibilities are virtually endless. If you are looking for even more mobility, download the On the Go app on your devices and you can enter expense claims while you’re out, create cases, approve documents and update contacts; wherever you are. You will never have to worry about wasting time on the commute home again. If you have ever felt your commutes are a waste of time, now you can use it for all of the above and concentrate on more important things while working from the office. Is your business growing? Would it benefit from the scalability and a secure cloud-based application for multiple users? Consider MYOB Advanced. Work whenever you want to work, anytime, anywhere. To hear what other businesses have experienced after implementing MYOB Advanced into their business, check out our MYOB Advanced case studies here. No matter what stage of growth you are at, choosing the right implementation partner for your business is just as important as the software. Look no further than MYOB’s Number One Partner. Contact us today for a free, no obligation consultation. This is article 3 in a series of 3 articles. This article covers “Performance Appraisal and Performance Management”. Article 1 covers “How to appoint the best talent to work for your company”, Article 2 covers “The First Day”. Refer back to article 1 in the series that discusses laying the ground rules. Your job description should contain the key performance indicators that will be used to assess the employees’ performance. There are two schools of thought here. The first approach is to separate out performance reviews from remuneration reviews. The benefit of this is that you set up a process whereby you are able to give honest feedback to the employee about their performance, without this being linked to an expectation of a salary increase. The second approach is to combine the performance review and the remuneration review. This is often done where good performance is automatically linked to an increase in remuneration. The performance review is aimed at identity differences in perception between the employee and their team leader or reviewer. For example, the employee may think they are doing a great job. However, the team leader feels they have the potential to improve. These differences often lead to conflict. You should use the performance review as an opportunity to have a dialogue about performance as well as aspirations. You should try to nurture every key member to play to their strengths. While the focus should largely be on Key Performance Indicators (KPI’s), a review should also deal with more subjective indicators. Using a tool like Survey Monkey (an online survey cloud-based software tool) will allow you to create “branches” or workflows to your performance review. For example, employees that have been with the company for longer, are asked different questions to new starters. A good initial question to ask the employee is “ are there any aspects of your role that you do not understand”. This gives them the opportunity to discuss these. Other questions could focus on whether they believe they have the acquired skills and knowledge to perform their role well. This leads into a discussion about personal development and learning. Employees can also be asked what contribution they make to the organisation as a whole. When asking more objective questions related to KPI’s, it is a good idea to compare the reviewers rating with that of the employee. For example, you may ask the employee how they rate the quality of their work on a scale of 0-10. The employee may give themselves a 10 for accuracy and a 10 for thoroughness. Whereas the reviewer may be giving a score of 5 and 4. The discussion would then centre around the reasons for these large differences in perceptions. If the employee has a measurable target, for example, sales dollars or billable hours, the conversation would be around the actual metrics. A salesperson that is required to sell 20,000 dollars of goods per month and has only sold 10,000 would need to explain why his or her performance is lacking. The review should always be done in a positive light in the example above. The reviewer or team leader should be asking the employee what the company could do to assist to improve the employee’s performance. Another question is asking the employee to nominate areas where they feel they could improve. Identify key factors that are inhibiting their capacity to play to their strengths. This can be rounded off with a discussion about what the company could do to assist the employee to achieve excellence. Finally, ask the employee to rate their satisfaction on a scale of extremely satisfied to dissatisfied. At the end of their review session, it is a good idea to write down an agreement with the employee on what they will be doing. Their team leader should also note this to address any issues that are raised. If your performance review is linked to a remuneration review, the discussion now becomes one about a standard CPI increase (Consumer Price Index) or increased remuneration for good performance or increased remuneration for additional responsibility or productivity. Employees should understand that salary increases are not a given and that in order to make the company books balance, for every salary increase given, there has to be a commensurate increase in productivity. Some larger companies do like to ask employees to give feedback on their managers or team leaders. Be aware that this is a very political question and very few employees are able to give honest feedback about this for fear of a knock-on effect. At the end of the review, pose an open-ended question that allows the employee to make any comments that they feel are relevant. Set the date for the next review and conclude the session by thanking the employee for their good work over the past period. In order to continue growth in your business, it is important to consider the challenges of recruitment in today’s world. Follow this with the process you should choose to fit your business. Following this, the right processes taken to review an employee’s performance will ensure productivity improvement in your company. MYOB Enterprise products such as MYOB Exo and MYOB Advanced are designed and built to meet the needs of your business. How? Because MYOB invests more time, effort and money into ERP product development than any other provider to make sure your business stays ahead of your competitors. It is no secret that Kilimanjaro specialises in MYOB ERP. Our “Farmers not Hunters” approach allows us to work closely with our clients to build long-term relationships and to understand your business needs. That’s how we have become MYOB’s largest and most experienced implementer. We pride ourselves on being your technology Sherpas and are proud to have helped over 1000 business overcome their constraints and achieve growth. 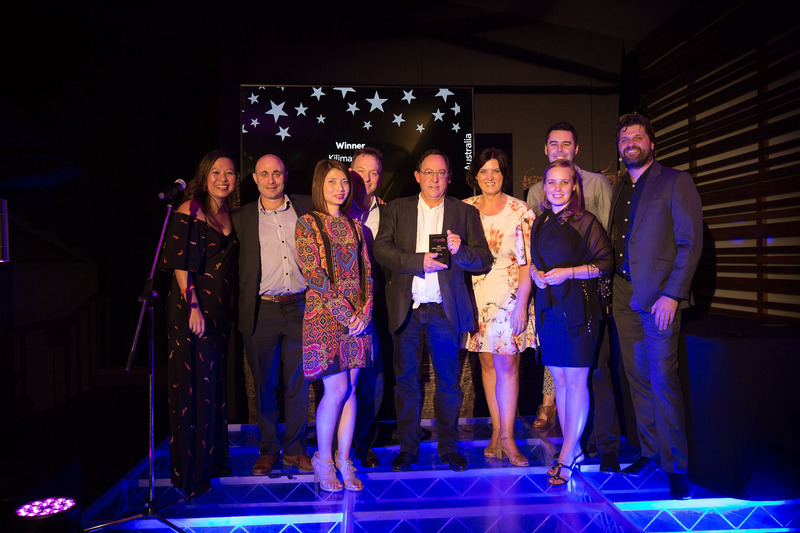 Being the leader in this industry has led to us becoming MYOB’s first Diamond Partner – the highest recognition that MYOB awards. We have backed this up by achieving the MYOB Excellence in Business development for 7 continuous years. What are your benefits of working with MYOB’s Number One partner? We focus on understanding your unique business needs first. If you have been running a company for a while, you will recognise that having a trusted partner is a key element to your success. You may have invested time and money where you shouldn’t have and, instead of getting a trusted guide, ended up paying twice as much for poor service. Your own time gets wasted as well. When choosing Kilimanjaro, we guarantee you are in the safest hands. The awards and recognition we have achieved in the past attests to our reputation as a trusted advisor. What benefits will you gain when working with Kilimanjaro Consulting? Being MYOB’s number 1 Partner is not only hard-earned recognition but also a constant goal for us to ensure our services are always at the highest possible level. With our offices in Sydney, Parramatta, Melbourne, Canberra, Perth and Auckland, we can make sure someone is there for you whenever you need us. Believe or not, size matters. During busy periods like the EOFY, it is vital that your partner has the capabilities necessary to help when you are in need. That is why we have over 65 MYOB specialists ready to support you and your business. Kilimanjaro has been a feature of the Australian ERP landscape for over 12 years and has helped over 1000 business like yours. Not only does size matter, but experience counts. ERP is financial software. A successful implementation can be done only if the team matches software solutions skills with strong experience in management consulting, accounting, education, and business process improvement to maximise the value of the solutions delivered. Once the implementation of the ERP software is completed, you don’t want to be left alone. When choosing Kilimanjaro for MYOB enterprise support you will have access to a highly trained, MYOB certified team who are solution driven. We are one of the few MYOB Enterprise partners which can offer you and your team specialised MYOB training courses. With Kilimanjaro, you will have access to onsite, online and classroom training facilitates. The MYOB Training courses we provide have been officially approved by MYOB. Kilimanjaro rigorously follows a structured, low-risk process for software implementation. It combines your own understanding of your business with Kilimanjaro’s knowledge of MYOB Exo and MYOB Advanced to develop a tailored solution to address your business challenges. As with anything else in your business, change comes with risk. Before commencing an implementation, we conduct a risk/benefit assessment to ensure that the solution you have chosen will meet the requirements of your business, with a balance between budget and risk. Kilimanjaro is MYOB’s number one partner which means our relationship with the software vendor is strong and long-term. This means that after the implementation you will not be left alone if the vendors input is required. Selecting an ERP system is not an easy task and advice from a trusted source will help you make an informed decision. At Kilimanjaro Consulting we provide an initial, no-obligation, no-cost assessment and indicative budget for every business seeking business improvement through technology solutions. If you would like to discuss your options with us, please call on 1300 857 464 or email us for a consultation at [email protected]. As we progress into 2018, Kilimanjaro’s number of clients, team members and offices across Australia continue to grow. We understand the need for clients to have local and trusted support which they can rely on. Therefore, just recently we have doubled in numbers within our Sydney and Melbourne offices. As well as establishing a stronger presence in Perth. We are proud to see our clients benefiting from our MYOB Exo and MYOB Advanced implementations, support and consulting services Australia wide. From the award-winning array of coffee shops and restaurants, inspiring art and exhibitions and the fantastic people, Melbourne is a city that is hard not to fall in love with. It has a rhythm and lifestyle like nowhere else. Melbourne is also widely recognized as a place to run or start a business, being home to several retail and industry precincts small and large. Based in the thriving hub of Docklands our Melbourne team continues to grow, with tribe members who are experienced, committed and local. Whether its MYOB Exo or MYOB Advanced, it is important that you have the support you can rely on. Here at Kilimanjaro, we can help you choose and implement the right financial software solution which will support your business growth towards success. With consultants around Australia and New Zealand, our team is here to support and guide you when you need it. Why not make the most of the benefits of having local MYOB support? As the Number One Partner of the Number One choice of ERP software, you can be sure you are in trusted hands when you choose Kilimanjaro as your trusted partner. Which is the right ERP? If you are a growing business ready to move up to ERP software, or a larger company looking for a better system, you can contact us to talk about the most suitable solution for your business. At Kilimanjaro, we take you on a journey through our sales and implementation methodology. We have helped many businesses succeed. You can read our article with useful tips to help you get started. Alternatively, feel free to visit the friendly team in Melbourne for a cup of coffee and a chat about your business requirements. You can find our office here. Just as Kilimanjaro believes it is essential to consider the advantages of using an Australian ERP system to eliminate risks for your business, we feel equally strongly about providing local support. This is why Kilimanjaro have consultants in your local area. We can ensure accessibility and flexibility for our clients. This is from our growing pool of MYOB specialists in Melbourne. If you would like to learn more about the advantages of using local software in your company, have a read here. We understand the type of risks involved in business and technology, and we aim to achieve high levels of client satisfaction. The Melbourne team comprises of a qualified and dedicated specialist with a range of skills. The combination of “seeking to understand” individual business requirements with the tremendous knowledge and experience in implementation and support of MYOB Exo and MYOB Advanced means Kilimanjaro is equipped to guide and support you all the way through your ERP journey. From beginning to the end, there is nothing our Melbourne Team cannot help you with. We are here every step of the way. However, we believe in giving our clients all the resources and knowledge possible. This allows them to be as self-sufficient as possible. To achieve this, we have invested in training courses that teach practical experience in using the software. You don’t have to be our client – anyone is welcome to attend our range of MYOB courses. Click here to have a look at our Melbourne training courses. Whether you are a current client, MYOB Advanced or MYOB Exo user or a company that is seeking business improvement efficiencies through the intelligent use of technology; feel free to contact our Melbourne team or just drop by our Melbourne Office. As you may have noticed, MYOB has recently partnered with Network Ten’s Shark Tank, helping business owners and entrepreneurs pitch their ideas. A great addition to this partnership is an offer for new Australian customers to have the chance to win a lunch with the Founder of Boost Juice, providing help for businesses who deserve that extra boost. 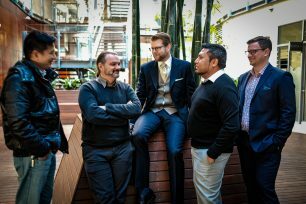 To read more about how MYOB is supporting Australian and New Zealand startups, read the entire story here.